My Brother , Vijay Studying Btech Civil Engineering in Narasaraopet. 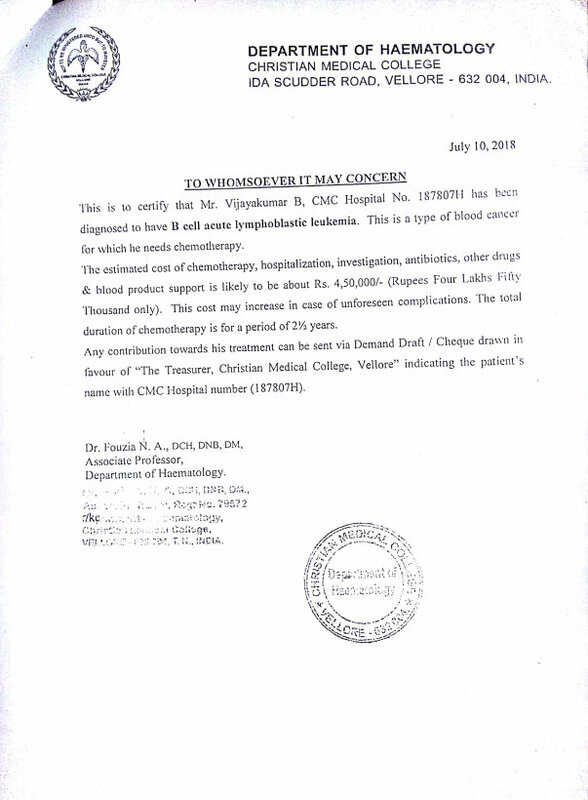 He has been diagnosed with a severe form of blood cancer called B-Cell Acute Lymphoblastic leukemia. 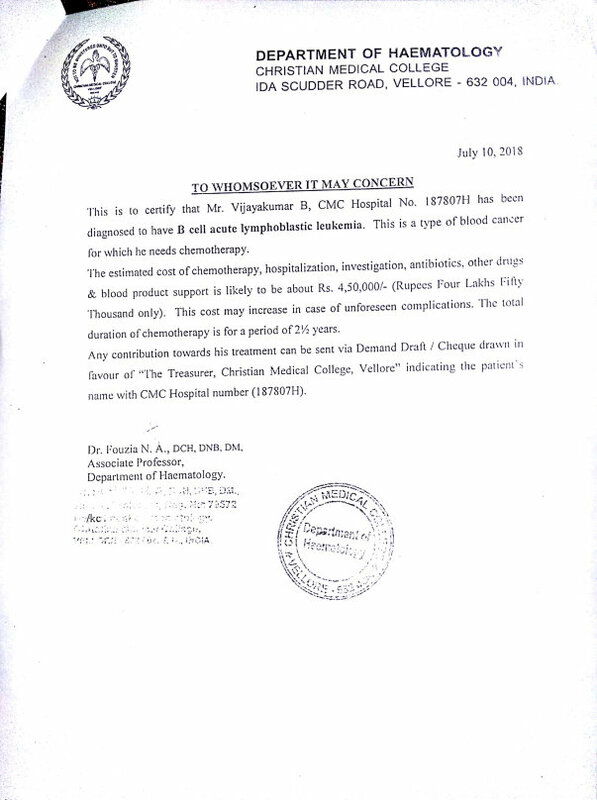 This is A type Of Blood Cancer For Which He Needs Chemotherapy. The Estimated Cost Of Chemotherapy , hospitalization, investigation, AntiBiotics, other drugs & Blood product support Is likely to be about 4,50,000. This Cost May Increase Incase Of UnForeseen Complications. 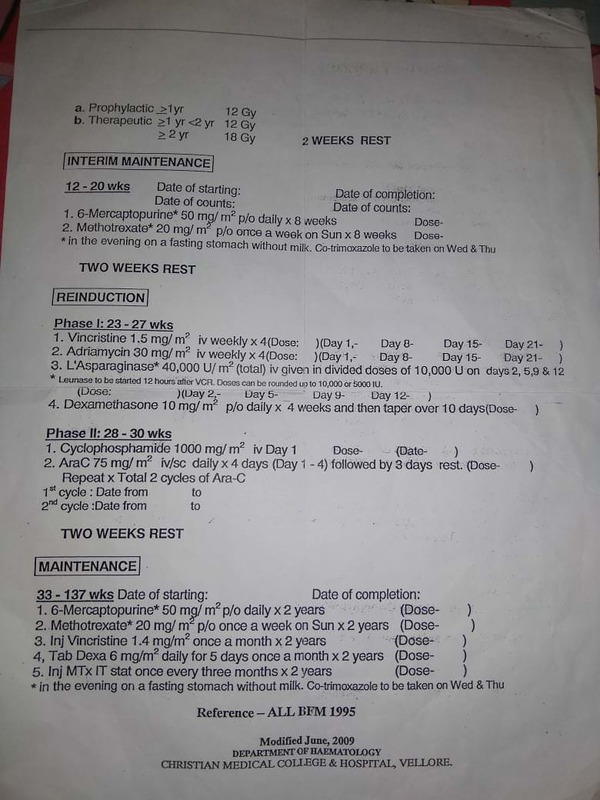 The total Duration Of Chemotherapy Is For A Period Of Two and half years . The Cost Break Down Charges For The Same Shown Below. Vijay's Father is A Daily Labour, With Whom The Family Getting daily Needs, But After Knowing That Vijay Is suffering with this particular From Of cancer, His Father & whole family Can't Digest this heat swelling news.. One More Thing That 6 Days Back , The College Staff Conducted A Blood Group Test For Mentioning the Fellow Students Blood Groups In Thier Idenification Cards & The Particulat Doctor , Who Came There Conclude that Vijay Has A Form of Blood Cancer.. The Doctor Informed it To College Staff, & College Management Discussed with Parents..
Vijay has been fighting his health. He started having symptoms of back pain, fever and severe weakness. Vijay and his family have already been through so much together. His brother Charan (Me) has set up a campaign on Milaap to raise funds for the treatment. Your support will make a huge difference to Vijay and his family. They need to deposit 6 lakh as immediate treatment expenses. 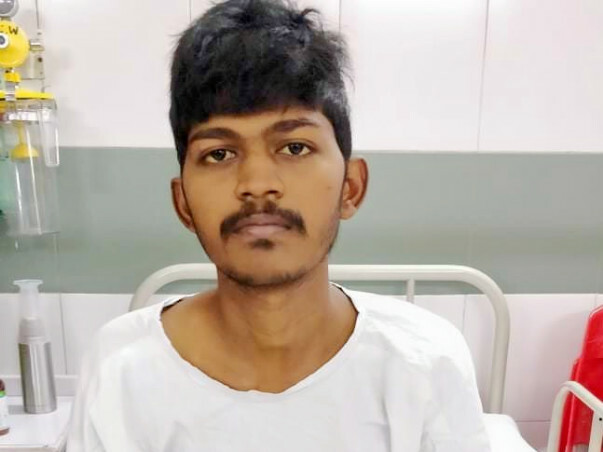 A small contribution from each of us can help save Vijay's life. As Mentioned Target 6 Lakhs May Increase In Case Of Unforeseen Complications.. 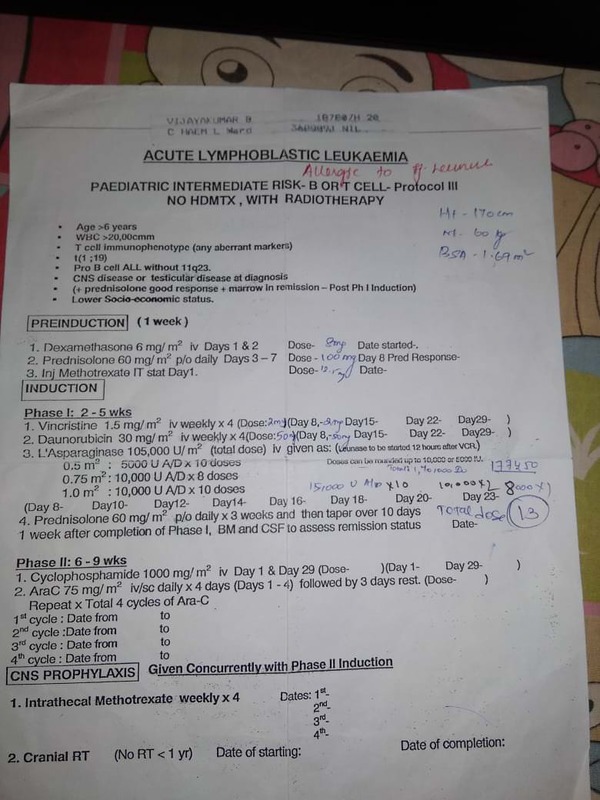 Your Individual Contribution Will Make a Difference For The Family To Save Vijay From B-Cell Acute Lymphoblastic leukemia. Doctors have Checked Vijay For his Reinduction Treatment.. 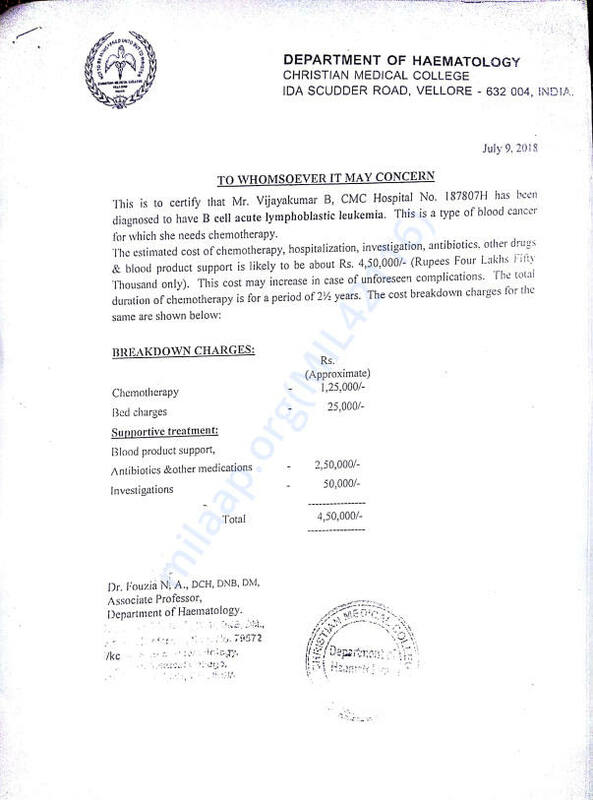 They Detected That He's Some what Recovered From the Disease & They Recommended that He doesn't Needs any type of further Treatments Like Chemo's, Reinductions.. And They completely Discharged From Hospital, Because Vijay's Disease Became a Minor One Which will be Completely Recovered With Oral Medicines & Vijay Should Go To Hospital For Monthly Check Up's! Our Sincere Thanks to Milaap & the Donors Who Supported. This Pictures Showcasing Vijay's Cycling Purpose Which is Still Going On for Vijay.. Vijay is currently Taking Rest.. & Will Get back for 'Reinduction' Treatment After 16th of this Month, Which Will Be Continued For Around 6 Weeks.. With God's Grace He Gets Recovered After the Final Stage Of his Chemo. We're Truly Grateful For all the Donors who Supported the Noble Cause, & We shall keep You Posted If we get Any Info Regarding Vijay. Vijay has been Recovered From Fever & Severe Headache.. So He Underwent For the Final Stage of His Chemotherapy Treatment Yesterday, Which Will be Continued Till the End Of November! We're Sincierely Thanking Each And everyone Who Supported, once again!